Banks get a lot of press for being big. Some is seemingly a positive. Some, not so much. And the good of being small? Is there any value to a bank that is small? Read on. It’s not always clear, the importance of size. Banks get a lot of press for being big. Some is seemingly a positive: big network of ATMs; big network of bank branches. Some, not so much: big scandal; big fine; too-big-to-fail. Whatever the big attribute, if the popular adages ring true (all press is good press and bigger is better), big banks are winning in being top of mind when most people think about banks. But here’s what doesn’t get as much press: you have a big selection of banks to choose from, many more than you may have ever considered, and there’s a big correlation between the size of a bank and how it uses your money. The biggest banks in the US (those with more than $1 trillion in assets) put an average of $36 of every $100 in the bank into communities as community investments*, mostly in the form of loans for business, housing, construction, farms, and public works. And when it comes to smaller banks? The banks with less than $50 billion in the bank -- 99% of banks in the country -- put an average of $72 of every $100 in the bank into communities as community investments. That’s double the average of the biggest banks. This means that if Small Bank A and Big Bank B are both working with $10 million in the bank, Small Bank A invests $3.6 million more into communities than Big Bank B. That’s 36 small business loans of $100,000 each. Imagine you’re walking down a street where 36 storefronts each received $100K in working capital as a loan, versus another street in which those loans weren’t made. Which street would you rather stroll on a Saturday? Close to which street would you prefer to own a home? If you like to see storefronts occupied and your property value increasing, we assume you’d vote for the street where the small business loans were made. Here’s a view of the community investing focus of the bank industry, divided out by bank size. Data Source: Federal Financial Institutions Examination Council, Call Report and Uniform Bank Performance Report. Q3 2018. Dollar for dollar, banks with less than $50 billion in total assets — again, 99% of all banks — put more financing into communities than the 40 or banks with more than $50 billion in total assets. Even the smallest banks in the country -- those with less than $250 million in total assets — put more money, dollar for dollar, into communities than banks more than 200 times their size. Another way to look at this is to consider the 100 individual banks in the US that put more of their total money into community financing than all the rest. These banks invest $92 or more of every $100 in their banks into communities. We’ve charted these banks by bank size, below. The 100 banks, grouped by bank size, that put the most of its money into community financing. Shown as a percentage of each asset class. None of the top performing community-investing banks have more than $10B in assets. How about banks that focus on financing important modern issues, like racial equity? Banks certified for financing racial equity in the US, grouped by bank size. Chart shows the percentage of banks in each bank asset class. Data Source: Federal Deposit Insurance Corporation (FDIC) list of Minority Depository Institutions. Q3 2018. The US government certifies banks that contribute to the advancement of racial equity both through their ownership and governance structure (banks majority owned and/or governed by people of color) and through their part in serving communities of color. None of these banks are larger than $50 billion in total assets, and the majority have less than $500M. For banks focused on financing poverty alleviation, women’s equity, and sustainability, the pattern holds. Banks focused on financing areas of impact, grouped by bank size. Chart shows percentage of banks in each asset class. Data source: The Office of the Comptroller of the Currency (OCC) list of women-owned banks; the Global Alliance for Banking on Values list of member banks; the certified B-Corporation directory; the US Department of Treasury list of Community Development Financial Institutions (CDFI). Q3 2018. Banks certified for their sustainability financing focus are likely to have somewhere between $1 and $10 billion in assets. All banks in the US certified for their roles in funding poverty alleviation (certified Community Development banks) have less than $10 billion in assets. Most banks owned by women have less than $250 million in total assets. To sum it up: Banks that are smaller in size seem to have lending and governance structures that enable them to focus on funding important communities and causes that may otherwise be overlooked by the largest banks as a priority line of business. If you want your money to finance communities and issues like sustainability and poverty alleviation, the smaller banks are more likely to direct more of your money toward these efforts. *For this analysis, Mighty defined dollars invested into communities as dollars in: small and large business loans, small and large farm loans, consumer loans, construction loans, housing loans, and public works loans and securities. Everyone used to bank with the local bank, but the building down the block is no longer necessarily locally-controlled. Here are stories of people navigating the current banking marketplace as part of the modern movement to bank for impact. Who is banking for impact? Do-good millennials? The uber wealthy? The guy down the block? The three-generation family that’s synonymous with their town? People who like information transparency? People who like their money to serve their interests? The World Economic Forum wrote that depository institutions, or banks, were the original impact investment organizations, specifically those focused on poverty alleviation (Community Development Financial Institutions). Today, more than 90% of adults in the US having a bank account. Meanwhile, less than half hold investments in financial markets. The bank account is arguably the oldest — and today’s most accessible — impact instrument. Read how others have chosen to find the best bank for their money and values, whether it’s for their checking account, savings account, CD or business banking. A bit of change can make a big impact. Comedian Sarah Silverman moved all of her money away from a big bank in protest of the Dakota Access Pipeline, saying “We can vote, we can protest, but another active thing we can do is watch where we spend our money...we have a ton of power in places we never realized, and one of those places is where we do our banking.” Watch Silverman speak about this on video. Rapper Killer Mike urged members of the black community to put their money in black-owned banks. In the first five days, more than 8,000 people opened up accounts. See press coverage via HuffPost, NY Post and Pitchfork.com. For Jeff Beckham, Founder of Black Box Creative in Chicago, banking is another way of strengthening his connection to the community. He uses different banks for different reasons: one strictly for transactional purposes, and another for the values-aligned, neighborhood-oriented relationships it offers his business and his local community network. Family-owned Wabash Seafood in Chicago works with a community-focused bank because, according to the owners, "the bank understands small business ethos, the importance of small business relationships, and the importance of setting standards of excellence when making your name in small business." Bottom Line Yoga owner Lauren Goggins works with a local bank to achieve her mission of supporting wellness in Chicago. According to Goggins, “We're a purpose-driven Chicago company and value working with purpose-driven partners and clients." Green America advocates for the importance of banking with your values and putting your checking or savings to work building the local green economy. The University of Chicago deposited $1 million across four community-investing banks as a “practical and responsible solution in furthering the University’s commitment” to the surrounding neighborhood. Genesys Works provides pathways to career success for high school students in underserved communities and works with community-investing banks to help students open savings accounts as well as explore careers in banking with a first job in a community bank. The State of Rhode Island moved state cash to local banks and credit unions in an effort to “support local financial institutions lending to small businesses in the Ocean State." Ready to find a bank? Browse all banks, or take a look at featured banks. Is your bank a good representation of you? For the majority of the people in the US, when it comes to bank leadership, odds are: probably not. You stand for many things. Does your money back what you stand for? What does banking have in common with Hollywood, the US Congress, and large business? The Money Managers. The Dealers of Entertainment. The Architects of National Policy. The Job Creators. These industry and culture shaping positions demand diversified, representative control. One of every two people in the US is a woman. So equal representation would mean that men and women hold an equal number of seats at the leadership table. Yet only one woman owns a small business for every three men who do. One woman speaks in top Hollywood films for every four men who do. One woman holds a seat in Congress for every five males who do. One woman is CEO of a Fortune 500 company for every 17 men who are. And one woman owns a bank for every 372 males who do. The odds that you’re supporting a small business owned by a woman are 93 times better than the odds that you’re putting your life savings under the governance control of women bank owners. 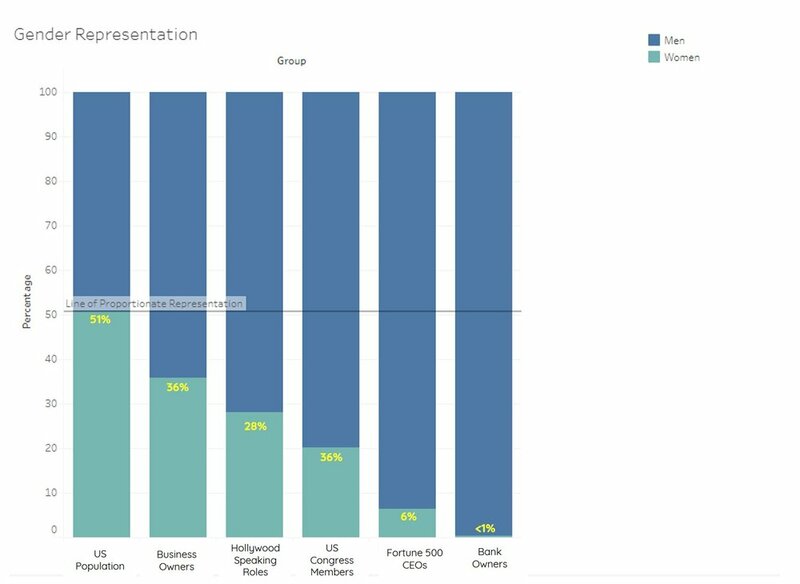 Women’s equity stakes are lacking across industries. In banking, it’s abysmal. Two of every five people in the US are people of color. And when it comes to top leadership positions? Two people of color own a business for every six white people who do. Two people of color speak in top Hollywood films for every six white people who do. Two people of color hold seats in Congress for every ten white people who do. And two people of color own or govern a bank for every 67 white people who do. For people of color, equity stakes are lacking across industries. Especially in banking. So what’s one to do? And what’s this got to do with you? Well, if you’ve got some cash, and have got some ideas, you’ve got some power. You can choose to undo historical and systemic patterns of inequities that are neither arbitrary nor benign by thinking before banking, and putting your money behind organizations focused on financing underrepresented groups. The majority of businesses in the US are small businesses. By supporting small business, you’re more likely to be supporting more equitable representation of female and minority ownership than were you to only support large businesses. By supporting organizations that are focused on supporting small businesses, you’re more likely to make a direct impact on growing women’s and minorities’ equity stakes within the economy. Backing organizations to help advance equitable representation isn’t about deciding how to better slice a pie. Rather, it’s about eliminating blind spots in influential sectors that shape our economy. From supporting small business to banking with banks that do, you can use your power to advance better representation across important economic and cultural institutions in the US. Or you can do nothing. While others harness their power to advance their interests, which may or may not be a good representation of you. Larry Fink is the CEO of BlackRock, the largest asset management firm in the world with over $5 trillion under its control. This guy is serious about companies making a positive impact, or getting left in the dust. Fink recently made major headlines (New York Times, Bloomberg, Forbes) for the letter he wrote and distributed to CEOs of public companies. You don’t have to be in charge of trillions of dollars to consider what this can mean for you. Play #1: Leverage the fact that you have choices in how and where you put your money. Just like Larry Fink is demanding social accountability and transparency from the companies BlackRock invests in, the American public can demand social accountability and transparency from the businesses they give their money to. Individuals and organizations can take a lead in financing a sustainable future that’s good for themselves while being good for the ecosystems within which they seek to thrive by making intentional decisions about how they spend, invest and bank their money. Play #2: Ask tough questions. What role do I play in the community? How is my money supporting or undermining my role in the community? Am I information-driven in how I bank my money, or am I putting off getting informed because I don’t know how to take action? You can choose to take the initiative to investigate the impact of how your money is serving or undermining your role in your community. The growing conversation about businesses delivering financial and social value need not be dominated by billionaire CEOs. Unless you choose to continue to sit on the sidelines while your money is in play. Sorting through bank information should feel like this. Earlier this month, the University of Chicago’s Richard Thaler received the Nobel Prize in Economics. He’s famous for his contributions to behavioral economics and his insights into decision making. To exemplify his statement above, Thaler suggested that if you want to get people to eat healthier foods, then put healthier foods in the cafeteria; make healthier food easier to find. What lessons can we learn from Thaler about making banking easy? The right choices need to be easy to make. 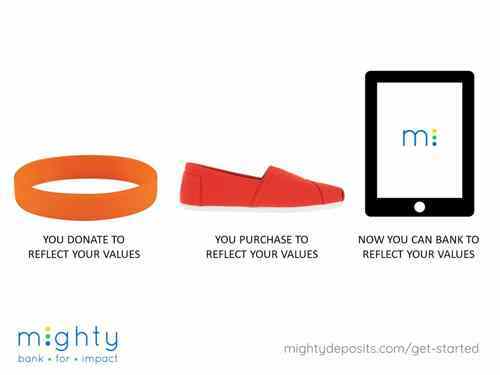 Mighty makes it easy to find banks that share your values. We often say we’re like Trip Advisor for banks, showing you new layers of public data about your bank, specifically the communities being financed by your bank (and your money). There are nearly 6,000 banks in the US to choose from. 12,000 banking choices if you include credit unions. Too many options can induce decision-making paralysis. We’re setting up a convenient, digital storefront to access bank information. We’re making it easy for you to know what your money is doing in your bank. And your choices when it comes to building your bank portfolio. You’ve likely heard of the impact investing economy, in which $1 trillion dollars is expected to target socially and environmentally-accountable investments by 2020. We hosted an event with Impact Engine featuring contributors to Fast Company and Forbes exploring the idea of choosing a bank that shares your values. SOCAP hosted an event the next day, and CNN covered the topic shortly after. A look at Google searches over the past years suggests that the idea of people choosing banks with consideration for the bank’s financing focus is a growing movement. Whether the public sees it as a form of impact investing or responsible consumerism isn’t as important as individuals and businesses being hungry to bank toward community outcomes that they can share in. Since Mighty started talking about impact banking last year, we’ve engaged thousands of users and garnered millions of media impressions that reinforce the idea that people and banks coming together around shared values is an emerging market force, and a force for good. I'm studying economics at the University of Chicago. I chose to intern at Mighty because I'm at the one of the best economic institutions in the world, but the growing sector of banking for impact is under-explored in the classroom. I think this will change, and I want be part of the team leading this change. Working at Mighty, I spend a lot of my time talking to people. I find that in these conversations, the reasons I care to work here and build a product I want to see in the world are reasons that others care about, too. Here’s a running list of themes I talk about with everyday people in my everyday. Mighty exists to help people feel mighty with their money, starting with their money in the bank. Who doesn’t want to feel that? Americans put a massive amount of money into banks: over $11 trillion in deposits. The average person has somewhere between a couple of thousand to tens of thousands of dollars in the bank. Not everyone has gobs of money, but everyone has something. This money has an impact on communities and does so in your name, if it’s your money, whether its $1 or $1 million. If you have money in the bank, your money is making an impact, touching lives, whether or not you realize it or not. Our mission is to make it easy for your to access information about your bank, your money, and how to wield the influence with your money that you want. People deposit money into banks in order to keep their money safe. When it comes to banks, people label convenience as knowing their money is kept safe, is earning some interest over time, and is accessible. What most people don’t think about what happens to their money after they deposit it. Wouldn't it be convenient to know that? Ever see Ferris Bueller's Day Off, in which the valet attendant takes Cameron's car out for a ride after the car is dropped off, but before he and Ferris return to pick it up? Taking your money out for a spin is what banks do with your money while you're away. Ever see It's a Wonderful Life, in which George Bailey and Henry Potter are both bankers, but run very different kinds of banks, with different motives? All banks do some lending and investing, but they do so differently. Some banks take your money for a spin to invest predominantly in global markets or large business markets, while other banks focus putting your money into motion to serve local markets and small business markets. The focus of the lending and investing activity depends on bank certifications, leadership and business model, and is evidenced by public data. Mighty harnesses public data to make clear how banks focus on lending to/investing in different markets and people (for example, the relative focus on local versus global markets, and local neighborhood lending versus Wall Street trading). Because when you drop off your car (or bike, or dry cleaning), you want to know what people do with your stuff, right? 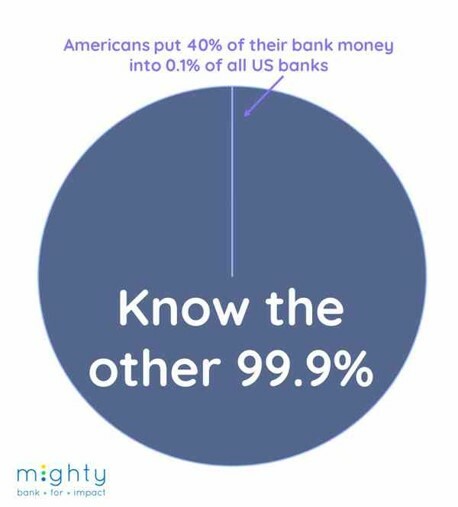 At Mighty, we hear most people would choose transparency of this information of what happens to their money while they store it in the bank, if it could be made available. So that's exactly what Mighty has set out to do. What Choice Do We All Have In Banking? Half of the country banks with one of a handful of the biggest banks. Most of these people started their first bank account with the help of a parent at one of these banks, or at a bank that was acquired by one of these banks. You may never have stopped to consider that you have more banking options than you realize. At one point, you started making your own decision (independent from your parents) about your preference for clothes, household items, and cars, but banking? 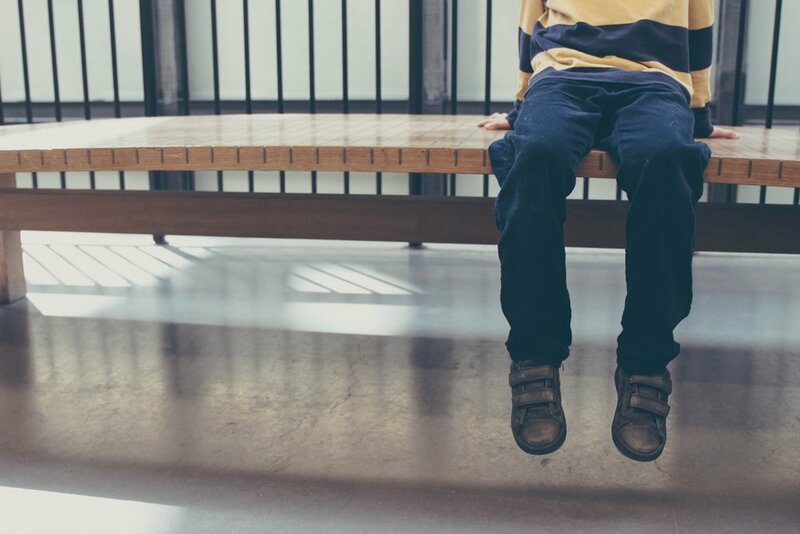 Surprisingly, many adults report they've never known how to assess a bank independent from what their parents taught them. With over 5,800 banks in the U.S. that are equally safe and increasingly accessible (as money goes digital), Mighty helps individuals make the best decisions for their money to serve their values. Care about your neighborhood? Small business? Local farms? Women-led enterprise? Investments in black communities? There are banks that serve these diversified interests. How about that for interest returns? Mighty is the marketplace to help you search banks at the intersection of money and meaning, to best serve your interests. Mighty allows you to see past the opaque wall of banking to transparently know your impact. We do this by digging through data that banks are required to report and making it legible. We make clear how your savings and checking is being invested. We help you choose to make your banking impact a powerful force for you and your world that matters to you. Your deposit has always been an investment into creating value. Mighty makes your impact -- what it is and what it can be -- clear. Is your bank kinda like Sandra Bullock? We hear most people on the street say that they don’t really understand what their bank does with their money or how it compares to what other banks might be doing with their money instead. When it comes to people choosing where to keep their money safe, or where to get a loan or mortgage, we all have less information about the societal impact of our bank choices than we do in our choice of breakfast eggs. Shopping for eggs, we have a remarkable number of clearly-labeled, meaningful choices for how to spend our valuable dollars. From cage-free to pasture-raised to organic eggs, carton labels provide us useful information to help us distinguish one farm’s practices from the next. This labeling not only helps us purchase the types of eggs we want, but also vote for and grow the markets that help to produce them. Want to minimize fertilizer runoff? Buy USDA Certified Organic eggs. Want to support local business? Buy eggs from a nearby farm. Are you an animal rights supporter? 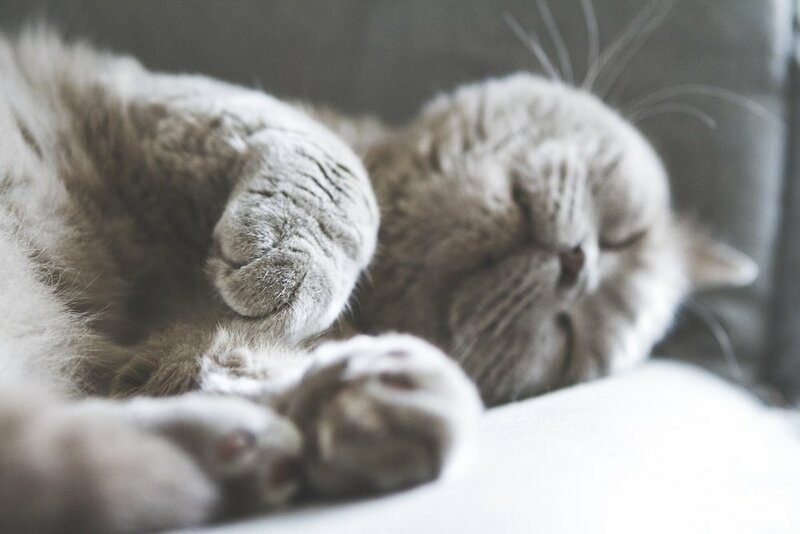 Check for the Animal Welfare Approved certification. This conscious consumerism isn’t limited to eggs nor food for that matter. Clothing, housewares and cars all market information about the societal impact of how these goods get to us, and the mark they make on the world when we use them. But banking? We all know that where we all spend our money matters, but we don’t always remember that where we all keep our money matters, too. The majority of our money in our savings and other bank accounts isn’t actually in the bank. Banks are required to keep only 10% of our deposits on hand. The rest of our money is used by our banks for lending and investing in different markets. Food and clothing companies give us lots of information about how our purchases of these products impact lives and the world around us. These purchases are comparatively small relative to the life savings we each keep our banks. We have a markedly low amount of information about what difference our choices in banking are making. This is where Mighty comes into play. Mighty uses public data to help you find banks that share your values. Banks that use your vote of confidence (and your business) to finance communities and causes in the world. Want your money to help build rural economies? Care about small businesses? Interested to help support life-changing investments in poor communities? There’s a bank for that. Mighty is like your window into the engine of banking, where you can see the different markets your money can power in different banks. With an estimated 6,000 FDIC-Insured banks in the country, and with money increasingly being managed digitally by all, we all have more banking choices than we realize. To be sure, labels don’t always paint the full picture. Measuring the impact of businesses on markets and ultimately on communities and the environment is an evolving practice. But increased accountability of companies to transparently communicate the impacts of their business models is not just the right thing to do. It’s the way that business will succeed in the future. Mighty is making great strides to help label products and services from competitive banks innovating toward community impact for customers hungry for this value proposition. We hear from people all the time who want to contribute to a world they believe in. People are seeking businesses that are making transparent the community benefits of their products. Mighty exists for the people who want their products with clear labels communicating the impact being achieved through the product. Or in egg parlance, sunny side up. That's how I'd summarize what happened during our past weeks on the road in Washington DC and Helena, Arkansas, during which time our team put Mighty's developing product into the hands of community leaders, community builders, community fans and shapers of the impact economy. Whether it was our talking to small business owners and local organizers gathered at the City First Third Annual Community Development Conference, or musicians and educators and travelers gathered at the King Biscuit Blues Festival in Helena, Arkansas, people's eyes opened wide as we introduced ourselves as a startup working out of the Polsky Business Incubator at the University of Chicago, dedicated to using public data to help everyone know the community impact of their banking business. It was exciting to join impact leaders (and Mighty's heroes) on the closing panel of the City First Community Development Conference on October 5th to talk social impact capital in DC. City First Bank of DC is the first of two banks in the country to partner with Mighty to pilot a new digital experience for customers to experience the community impact of their banking business. Brandon was one of a dozen entrepreneurs we talked with at Impact Hub DC about banking for impact in DC. Thanks Brandon for joining in on spreading the word to get #mighty. Geoff told us that when he moved down to teach in the Mississippi Delta, he moved his money with him as a way to be fully immersed in the local community, and an actively participating community member. Geoff signed up to get Mighty because he says he loves the idea of knowing more about how his money impacts his community. From that point on, we listened as people readily began talking about the importance of supporting local economies; small business development; affordable housing; equity of economic opportunity for low-income populations. We learned that across the spectrum, irrespective of job title or location, everyone cares deeply about the economy. Everyone is touched by it. Everyone is eager to build their agency in supporting the economies they value. A tool like Mighty, providing transparency of information and choice for the public to bank for impact, is an idea whose time has come. Danielle has lived in Chicago and Memphis. She told us she is interested to know how her bank money can help provide equity of economic opportunity to low-income populations. "Mighty is a really important, needed resource," Danielle said. Kory (left) told us he loves the Delta so much, he brought his brother, Casey, and dad, Billy, down for a roadtrip to experience the Blues. For his love of the Blues and the Delta, Kory told us putting some of his bank money to work in the Delta is a no-brainer. "It's a way for me to give back to a place I love, while I still get the security of banking that I need." For everyone pictured above, everyone we’ve spoken with, and for our interested readers now, we’re building this for you.